me about their new single, Blah Blah. They are a fresh and colourful Pop act that looks set to make big footprints in 2018. I ask them about their future plans and how they got the duo together. The guys discuss the combinations and sounds that inspire their own music and how their songs come together – whether it is a natural thing or takes a lot of time to get together. 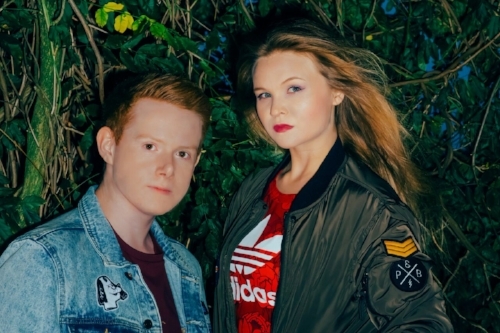 Alex and Ella tell me about the albums and legends that have moulded them; why their music has such a rich and instant chemistry; why they have worked with a range of different producers – and those new names we need to open our eyes to. Ella: Good thanks. I just got back from Rome! We're a new Pop duo from London. Blah Blah is the new song. It sounds quite dismissive and has a definite attitude. What provoked the song and how did you make it sound so addictive?! Alex: Haha, thank you! We always use our music as a way of venting - so the attitude and general bitchiness is something that just comes naturally to us. Ella: We’re nice in real life, we promise. How does a song like that come to be? Do you both work on lyrics and write music separately? What is the process for the duo? With this song, we were working with an amazing producer/songwriter called Dillistone and we all just sat down together drinking tea and bouncing ideas around. He was looking after a really cute sausage dog at the time - which I think helped a lot! What was it like working with Dillistone on the track? Did you feel safe being with such a talented producer? Alex: I genuinely think he's one of the most talented people we’ve worked with so far. He was just full of ideas and a nice guy. It seems, even this early, you have cemented a desirable and instant sound. Is that because of the chemistry with Cherryade? Ella and Alex. Can you remember when you met? How did you discover you had similar music tastes? Ella: We've been best friends since school! I used to bully Alex for being ginger in the playground till I realised he had all the new C.D.s I wanted. So, we became friends and I got him to burn me copies of everything. It was great! Alex: We also both hated that Catholic school and, once we got a bit older, started venting our thoughts into GarageBand demos - whilst getting drunk on cherryade and vodka before nights out. In terms of other musicians; who are the artists you are inspired by? Ella: Lil’ Kim was my childhood hero! I think Grimes is awesome too. Alex: Definitely MIA. I think that was the first gig we went to together. Cherryade have worked with a range of different producers. Is this because you don’t want to repeat yourself - or do you feel you are free to experiment with different names? We just love working and collaborating with different people. It’s important to us to always develop our sound and switch things up. Ella: I think this is the best way to develop. You have to branch out and try new things and we learn something new with every song we make. Is there more material coming? What can we expect as we head into 2018? Ella: We’re really going to up our game 2018: lots of stuff to come. There's a guy called Baby Tap who's really fun and crazy. He's got a song called Hillary Duff - which is amazing. Alex: Dominique is great as well. I’ve had her song, Use Me, on repeat. Ella: There's a girl from Norwich called Ginny Dix as well - who has an AMAZING voice. I got it when I was eight and I had no idea what it was about - but it was pink and my favourite thing. Alex: Ahhh, this is so tricky… I absolutely love Britney’s (Spears) Blackout album so let's go with that. It was just really unexpected and genius Pop. I want us to make an album with Danja! Finally, and for being good sports; you can each name a song and I’ll play it here.